A ‘leafy green’ Gotu Kola is used widely in green salads in Sri Lankan cooking. 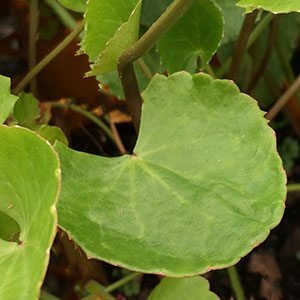 Also known as Indian Pennywort or Arthritis Plant it is also used both as a culinary herb and a medicinal herb in Indian and Sri Lankan cultures and given appropriate growing conditions Gotu Kola can be grown from seed in the home garden. Said to be good for the memory, arthritis, and as a general tonic. Gotu kola is a herb that is also used as a creeping ground cover, with small round green foliage. Widely distributed from India to Australia it is used in Chinese and Ayurvedic medicine. It is also used as a culinary herb both cooked and as a salad. Grows easily from seeds (or division) and prefers a shaded to part sunny moist position in a humus rich soil, protection from frost is essential. Gotu Kola can be grown in pots or containers and is also useful as a ground cover plant in appropriate conditions. In warmer climates Gotu kola can be invasive especially when given its favourite damp conditions. In cooler areas remember that this herb is not frost tolerant so maybe try growing in a pot or container and give some protection. So in warm moist conditions and this plant will thrive. Clumps can be divided in spring, and seeds can be sown at the same time. Usually sold as runners or root sets Gotu Kola is an interesting herb or ornamental plant for the garden. Generally available for sale from good herb nurseries as a potted plant or online as runners or seeds.